Suvaranam means “shiny like gold”. This is an herbal facial which makes the skin glow like gold. It contains Usheer (Vetiveria Zizanioides), Manjishtha (Rubia Cordiofolio), KasturiManjal (Curcuma Aromatic), Chandan (Santalum Album), Gulab Patti (Rose petals), Soya (Anathum Sawa), Pomegranate and Orange peel. All these ingredients are helpful to get rid of acne, breakouts, blemishes and pigmentation. It is helpful in removal of dead skin as well. The face pack has natural antibacterial and antifungal properties which provide natural cure for acne. Manjishtha (has astringent & anti-inflammatory qualities) and usher are helpful to get healthier skin. 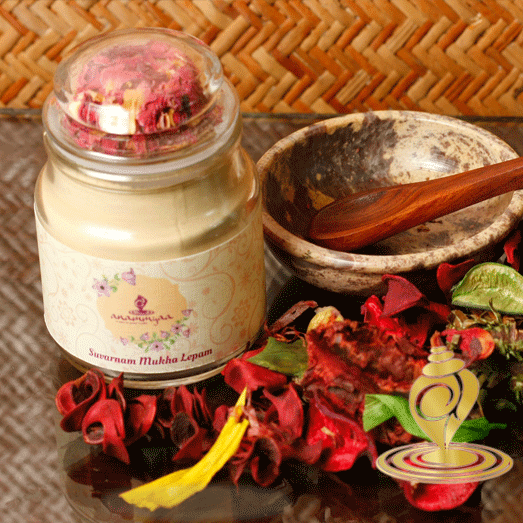 Rose petals, Soya and Orange peels help in removal of dead skin and attaining glowing skin. Greasy skin, acne & boils, blemishes, pigmentation & marks, and rash & fungal/ bacterial infections. Wash face with Rose water and pat dry. Take this powder and mix with rose water/ mineral water/ fresh orange juice and apply evenly on skin, neck and throat areas. Leave it for 10-15 mins maximum and wash with room temperature water. Use Anammyaa Wellness Avocado Face Serum for best results. Avoid using near eyes and mouth. The regular application of the face pack stimulates blood flow, peels away dead skin & pores which lead to healthier & taut skin. It has natural skin whitening agents therefore leads to removal of sun tanning effects. The face pack has a cooling impact on the skin which leads to removal of heat from the skin. Additionally regular use of the face pack will lead to reduction in acne, boils & colorations and skin tightening & fine lines removal.